Happy Thorsday, little friday, Thankful Thursday and snow day! Just to prove me wrong, after I ratted the furgirls out in the post on their blog, they awoke and followed me to the deck landing for a QUICK photo shoot. The Knight wanted to know what on earth we were doing, and I had to remind him that the girls don’t get free boxes from Chewy just because they’re cute; they have to work for their rewards! Regular readers know the routine. Each month, Chewy offers us an opportunity to review a product of our choice, from an ever-changing list of treats. This month, we tried the Wysong Dream Freeze-Dried Rabbit Treats. They are the new favorite… worth getting out of bed and braving the snow. I’m sure I sound like a broken record, but it’s still exciting when we find quality food and treats Sissy can eat, and Chewy has something on the list almost every month. Rabbit was the first safe protein source for Sissy, and she seems to have a special fondness for it. Plus, it’s not a routine flavor, so that makes it a real treat too. These aren’t hard, crunchy biscuits. They’re dried meat discs, and they are easily broken for sharing with a little sister. As you can see, Gretchen thinks they’re pretty awesome too. Add in that “made in the USA” fact and you really have a great treat for your cat, dog or ferret. They are designed to be part of a raw food diet, but your dog (or cat or ferret) will enjoy them whether you feed raw or not. There’s so much to be thankful for today! I’m delighted with our significant snow. I’m glad the Knight is feeling better after a nasty chest cold. And more broken recordness, but I appreciate having a job where I don’t have to try to get to work. I loved my career as a firefighter, but there was no calling in because I couldn’t get out of my driveway. Of course, we all like being a part of the Chewy Blogger Outreach program too. Clearly, the opinions expressed are our own. 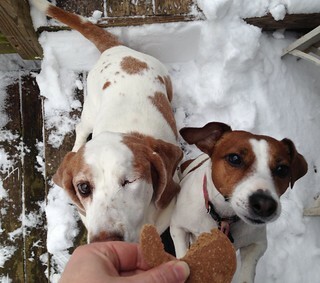 This entry was posted in DMwmT, Dogs on Thursday, Gretchen, Sissy, Snow, Thankful Thursday. Thankful you are sounding happy. Griefwork is so difficult. Grateful Pie’s nail issue required minimal manipulation at the vet. Grateful her eye pressures are stable and within normal range! I’m needing the exercise of thankfulness. My 3 smalls have been exercising their bickering attitudes…and I’m trying to snap out of grumpy mom attitude. I’m thankful for the weather we’ve been having. I was a bit jealous of all the snow my friends have been getting, but that gray skies would probably make my mood more gray. Thankful for sunshine. I’m thankful for M’s sweet cousin in NC. She is a blessing to me. I’m thankful that my kids are all healthy. I could have really sick kids, spending days in the hospital…so I’ll choose to be thankful for their health and ignore the snotty attitudes. Tomorrow is a new day. I’m thankful that after a collapsed lung, my sister’s preemie twin grandbabies are now both in fine health at three months old. I’m glad that you’re enjoying your snow (probably all the more because you know it will melt soon, right?). Adorable picture of the girls. We have 4″ new snow but it has slowed down, so who knows what will happen from here. Enjoy your snow day, and stay warm! Oh, and I’m thankful that we have natural gas heating, which can’t run out, and the generator, which means our power can’t go out! I was very grateful today for a sunny 55 degree day so the fur kids could play outside all afternoon and that Rob washed all the muddy legs. Our Chewy box arrived just in time for Fudge’s birthay tomorrow. Snow – they’re in it playing. Rain – they’re inside complaining. I’m thankful for travel by private plane! Love the photo of the pups! I’m thankful I got to paint for the first time in months! Thankful for snow day (no work) yesterday…read two books (helps if you wake up at 2:30 am to feed the wood stove…and don’t go back to sleep). DH is trying out the treats at your recommendation and so far the puppies are liking them with no digestive problems (a very thankful thing in this weather). Glad you had a snow day, too. Sorry about the Knight’s cold….hope you didn’t catch it! I hate to sound trite, but I’m thankful for no snow, cooler weather and that our hockey team beat Russia! So glad to hear that the Knight is feeling better! I love the look on Gretchen’s face. All fur babies should look so happy!! It is no longer Thursday, but I am thankful for being able to get back to work on Monday. All of the time in doctor’s offices and hospitals was weighing heavy on me. I keep telling myself that I will never complain about working again. We’ll see. I hope you’re doing ok! How is the new job going?